Congress and the Obama administration must get defense spending under control as the country faces large budget deficits and debt—especially since military spending did much to contribute to our budget problems. Total U.S. defense spending (in inflation-adjusted dollars) increased so much over the past decade that it reached levels not seen since World War II when the United States had 12 million people under arms and waged wars on three continents. Some of this growth can be attributed to the wars in Iraq and Afghanistan. 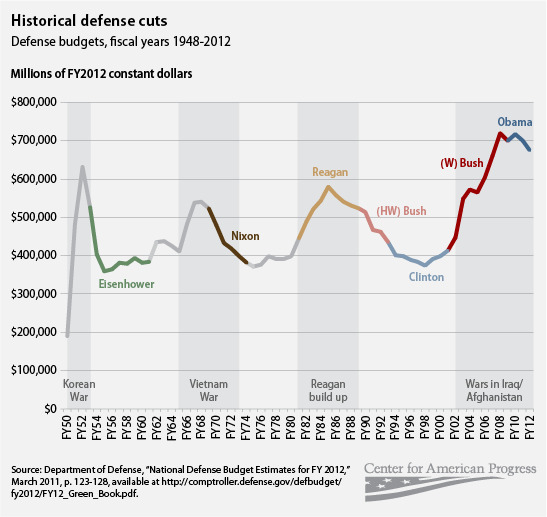 But the baseline or regular defense budget has also increased significantly. The baseline budget, which does not include funding for Iraq or Afghanistan, has grown in real terms for an unprecedented 13 straight years. It is now $100 billion more than what the nation spent on average during the Cold War. When war funding is added, we are now spending about $250 billion more per year than during the Cold War. This ballooning defense budget played a significant role in turning the budget surplus projected a decade ago into a massive deficit. As the Obama administration and Congress try to agree on a deal to raise the debt limit—an agreement that will inevitably involve cutting some money from the budget—they should keep in mind that they can cut $100 billion in defense spending annually and still keep our military budget at the Reagan administration’s peak Cold War levels of approximately $580 billion (all numbers adjusted for inflation unless otherwise noted). Bringing the defense budget down to the levels that existed under Presidents Eisenhower, Nixon, H.W. Bush, and Clinton would require reductions of $250 billion to $300 billion annually. The question currently facing Congress and President Barack Obama—how much to spend on defense in times of large deficits or in the final years of a war—is not new. In fact, the graph below shows that a number of presidents from both parties carried out significant reductions in the defense budget under similar circumstances since the end of World War II. 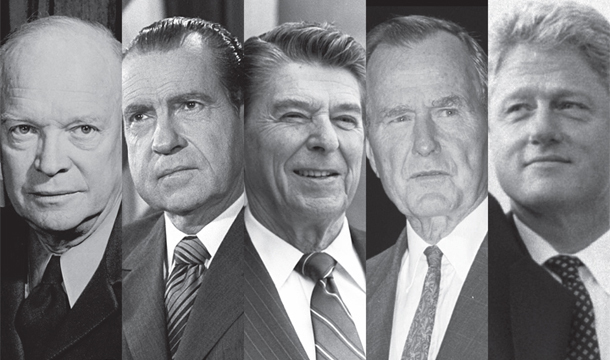 Presidents Richard Nixon and Bill Clinton needed to identify reasonable levels of defense expenditures as the United States transitioned from war spending to peacetime budgets, while President Ronald Reagan needed to control defense spending in the face of rising deficits. Presidents Dwight Eisenhower and George H.W. Bush, like President Obama today, confronted both scenarios at once. The graph below contrasts those budget reductions with the alarming defense budget growth during the George W. Bush administration as well as with President Obama’s first few defense budgets. This paper looks back at the post-World War II presidents who cut the budget to see how they brought defense spending into balance in the face of deficits and war drawdowns. It shows how each president made decisions based on a number of factors including the threats the country faced at the time. These particular presidents were selected because they were in office during the country’s most significant post-WWII drawdowns, as is evident from the chart above. We can draw three major lessons from the reductions, though there are others we will point out throughout the paper. To keep a balanced budget, President Dwight Eisenhower, a five-star Army general and lifelong Republican, slashed defense spending by 27 percent after the armistice that ended the Korean War. President Richard Nixon, also a Republican and Eisenhower’s vice president, cut the defense budget by 29 percent as he withdrew from Vietnam. Between 1985 and 1998 the defense budget fell for 13 straight years as Presidents Reagan, Bush, and Clinton—two Republicans and a Democrat—brought spending down to more sustainable levels as the Cold War wound down. 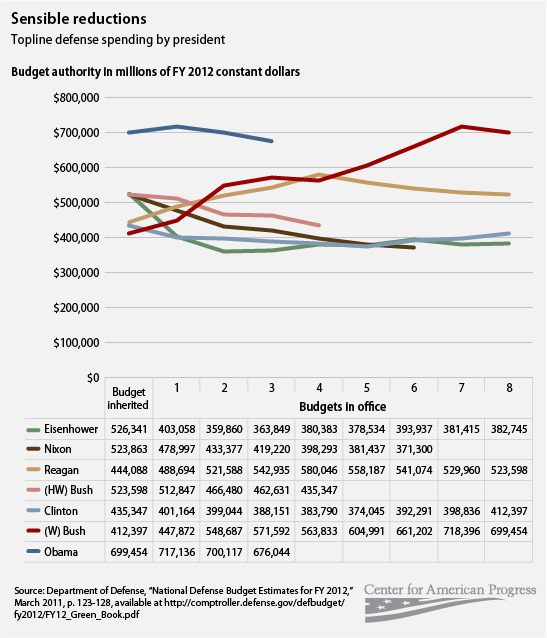 The spending cuts usually attributed to President Clinton and, on occasion, President George H.W. Bush actually began during the Reagan administration’s second term when the United States was still engaged in the Cold War. This smaller military drove the Taliban out of Afghanistan in 2001 in a matter of weeks and successfully ousted Saddam Hussein from Iraq. It might have fared better in both conflicts in the long term had the George W. Bush administration not insisted on an inadequately light footprint in the early years of those wars. Presidents Eisenhower and Nixon balanced sensible budget cuts with investment in the future of the force. President Eisenhower cut the defense budget by 27 percent during his time in office, but he also doubled funding for research, development, test, and evaluation, or RDT&E, so the United States could maintain its technological edge over the Soviets. It was the Eisenhower military that convinced the USSR to back down in the Cuban Missile Crisis. President Nixon also substantially reduced defense spending. But he outlined a more significant role for the military reserves (the Total Force) to ensure a smaller active-duty force had the support it needed to be successful in future conflicts. He also instigated a plan for aircraft procurement known as the highlow mix, meaning the services would diversify their purchases among expensive advanced fighters and less costly but still very capable planes (F-15s and F-16s for the Air Force and F-14s and F/A-18s for the Navy and Marines). This strategy allowed the Pentagon to buy a sufficient number of fighters at an acceptable cost. The F-16s and F/A-18s are still in service today and were used extensively in the first and second Gulf wars, from 1990 to 1991 and 2003 to present, respectively, and the Kosovo conflict in 1999. The Obama administration inherited a defense budget far in excess of even President Reagan’s peak Cold War spending. And the idea that budget cuts will result in a “hollow force” or be catastrophic—advanced by critics such as former Defense Secretaries Donald Rumsfeld and Robert Gates—simply does not stand up to historical scrutiny. The Obama administration and Congress could cut $150 billion from the administration’s current budget request and still be at average Reagan levels. President Obama would need to reduce the budget by about 40 percent, or close to $300 billion, to reach the budget levels established by Presidents Eisenhower, Nixon, and Clinton. With these lessons in mind, we recommend that the Obama administration implement the following list of defense cuts to transition to a responsible and sustainable level of defense spending. These reductions would allow the president to reduce defense spending by $400 billion through 2015 without compromising U.S. national security (the paper will examine these in more detail). Redirect the Defense Department’s planned efficiency savings to reduce the baseline defense budget ($133 billion through 2015). Roll back post-September 11 efforts to grow the ground forces and reduce the number of civilian DOD personnel concomitant with the reduction in military end strength ($39.16 billion through 2015). Reduce active-duty troops in Europe and Asia by one-third ($42.5 billion through 2015). Cancel the V-22 Osprey program ($9.15 billion through 2015). Reform military health care ($42 billion through 2015). Limit procurement of the Virginia-class submarine and DDG-51 destroyer to one per year, and limit procurement of the littoral combat ship to two vessels per year ($20.04 billion through 2015). Cut procurement of the Navy and Marine F-35 Joint Strike Fighter variants ($16.43 billion through 2015). Institute an across-the-board reduction in research, development, test, and evaluation funding ($40 billion through 2015). Reform the military pay system as the 10th Quadrennial Review of Military Compensation recommends ($13.75 billion through 2015). Cancel procurement of the CVN-80 aircraft carrier and retire two existing carrier battle groups and associated air wings ($7.74 billion). Cut the U.S. nuclear arsenal to 311 operationally deployed strategic nuclear weapons ($33.72 billion). Defense spending helped create the fiscal crisis facing our nation today, and defense cuts must be part of the solution. The president and Congress can continue a bipartisan tradition of restoring defense spending to sustainable, responsible levels as the United States winds down its involvement in Iraq and Afghanistan. Lawrence J. Korb is a Senior Fellow at American Progress. Laura Conley is a Research Associate and Alex Rothman is a Special Assistant with the National Security and International Policy team at American Progress.